Cat Priem welcomes you to the fantasy world of her extraordinary jewelry designs. Where fanciful shapes blend perfectly with austere lines. Where cute details sometimes turn out to be rather subversive. With each series Cat creates a humourous fantasy world rich in paradox, drawing from fairytales, architecture, nature or life events for inspiration. Each piece is handmade, finished to the finest detail, often ornately decorated and functional at the same time. 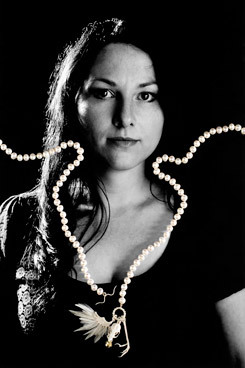 From her childhood years in the Dutch coastal town of Scheveningen Cat Priem (born april 7 1974) has poured all her energy into her great passion: designing jewelry. After the Trade School for Goldsmiths in Schoonhoven Cat studied an extra year of technique at the Trade School for Goldsmiths in Amsterdam. Cat then went on to work at Beaufort, Galerie Zigt and Galerie Brooz, all of which are renowned in The Netherlands. After that she became a goldsmith at Dutch firm Gem Kingdom. Cat Priem is now working independently, creating her own collections.